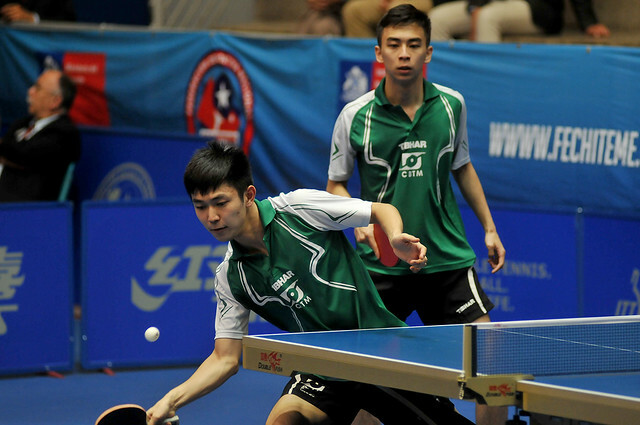 The no.9 seeds, somewhat outsiders for a place on the podium, the United States continued to defy the odds in the Men’s Team event at the Sparta 2018 ITTF Pan American Championships in Santiago on Wednesday 21st November. Alongside, Paraguay, the no.5 seeds, they emerged surprise semi-finalists. A full distance three matches to two success was recorded by the United States trio of Kanak Jha, Nikhil Kumar and Nicholas Tio in opposition to the no.3 seeds, the Argentine combination of Gaston Alto, Horacio Cifuentes and Nicolas Galvano. Man of the match was arguably Gaston Alto but his efforts were to prove in vain. He partnered Horacio Cifuentes to doubles success against Nikhil Kumar and Nicholas Tio (11-9, 8-11, 11-8, 11-5), before in the fourth match of the fixture accounting for Kanak Jha (6-11, 15-13, 11-9, 11-6). Impressive from Gaston Alto but a true team effort was to guide the Stars and Stripes to victory. In the second match of the engagement, Kanak Jha had accounted for Nicolas Galvano (11-8, 11-6, 9-11, 12-10), before Nikhil Kumar overcame Horacio Cifuentes (11-8, 11-6, 11-9) and Nicholas Tio sealed the victory by defeating Nicolas Galvano (11-6, 6-11, 11-8, 11-8). A hard fought full five match distance success for the United States; it was the same for Paraguay’s Marcelo Aguirre, Italo Ibañez and Alejandro Toranzos, in opposition to the no.6 seeds, the Mexican combination of Dario Arce, Marcos Madrid and Marcelo Aguirre. Star of the show for Paraguay was Marcelo Aguirre, hero of the hour was Italo Ibañez. Marcelo Aguirre partnered Alejandro Toranzos to doubles success against Dario Arce and Ricardo Villa in the opening match of the engagement (6-11, 11-2, 11-4, 11-4), before in the fourth contest overcoming Marcos Madrid to level matters (11-8, 11-8, 11-9). The outcome in the balance, Italo Ibañez accounted for Dario Arce in three straight games (11-8, 11-5, 11-3) to secure the semi-final place. Success for the United States and Paraguay, there was also success for the leading outfits. Brazil, the top seeds, selecting Eric Jouti, Thiago Monteiro and Humberto Manhani beat the no.7 seeds, Cuba’s Jorge Campos, Livan Martinez and Andy Pereira by three matches to nil; more significantly, on home soil, the no.2 seeds, led by head coach, Marcos Nuñez, the Chilean trio comprising Gustavo Gomez, Juan Lamadrid and Felipe Olivares enjoyed success. They recorded a three-one win in opposition to the no.4 seeds, the Puerto Rican combination of Brian Afanador, Daniel Gonzalez and Ricardo Jimenez. Mainstay of the Chilean success was Juan Lamadrid. In the opening match of the fixture, he partnered Gustavo Gomez to success against Brian Afanador and Daniel Gonzalez (12-14, 11-8, 11-5, 11-8), before in the third encounter overcoming Daniel Gonzalez (10-12, 11-9, 7-11, 11-2, 11-6). Felipe Olivares, who had earlier lost to Ricardo Jimenez (11-4, 11-8, 11-9), accounted for Brian Afandor in five games (6-11, 11-9, 8-11, 11-9, 11-5) to seal the victory. Pertinently, Brazil, Chile, Paraguay and the United States have now qualified for the 2019 Pan American Games to be staged in Lima, Peru. At the semi-final stage in Santiago, the United States meets Chile, Paraguay confronts Brazil; the Men’s Team event will be played to a conclusion on Thursday 22nd November.